So ends another year of Quarters arts Glow. For those unfamiliar: Glow is a Lantern parade organized by Quarters Arts to celebrate the spring equinox. I have been working with Glow, as a lead artist, for the past 3 years to help people bring their ideas into fruition. Its a one month whirl of workshops thats ends with us parading our amazing pieces throughout the Quarters! No matter how busy the month is, I always have time to create a piece of my own for the parade. With this years theme being outer space I knew I had to do my take on an alien. The plan: An alien with feline features. It will be able to move its head and perhaps open and close its mouth. It will be distinctly feline but still clearly other-worldly. It must have distinct personality and it must fit through doors. like with any project, I start the process with researching references. I knew my Alien would have feline features. So cats were important to research. note: In the past I refused to use references for my concept art because I felt it was cheating. If you also think this way, stop it! Because I swore not to us them for so long I’m still learning how valuable having a reference is. example: if you make a reference, use it. Refer back to it every step you take! (don’t just stick it in a drawer and try to remember what you drew… *this advice is brought to you by real life experiences. This is the finished concept art I created for the Alien head. From here I knew that I needed a structures for it to sit on my head. That way when I nodded, it nodded. Supplies: I needed a helmet that could support this large creature. How much for that one? But it did lead me to these! Only $3 dollar more then a bike helmet, and with a lot more support that will prevent shifting on my head. This was very important to me because I wanted to be able to have complete motion of my head, without feeling like it may slip off. 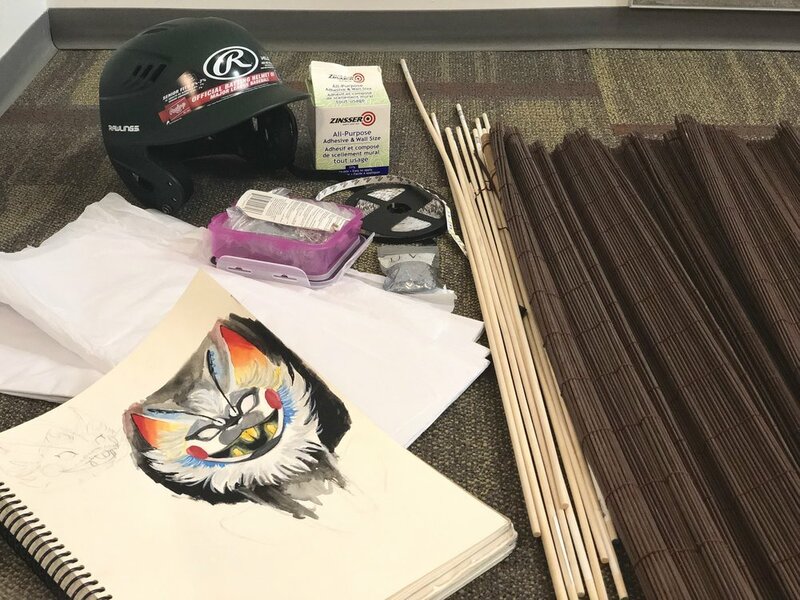 The rest of the supplies consist of: bamboo curtain, dowel, tissue paper, wall paper glue, a baseball helmet, and of course the reference. Followed by a few different attempts at shoulder support for the bottom jaw. attempt one for bottom jaw: Pool noodle with straightened curtain rod for shape… it didn't hold the shape. attempt number two: one made of bamboo and tape. This one is better! I felt, at this point, I had a fairly good grasp of the bottom jaw. So it was now time to move on to the rest of the head. I started with the eyes because they helped me establish the the size of the rest of the head. The first test was a dish from the Dollarama. However in testing, It didn’t allow enough light to pass through. I attempted paper macheing my tissue and wall paper glue using as a form. However, it just kept ripping to pieces when I attempted to remove it. Third was a lamp cover I tried to cut and melt into shape but it was much more resistant then expected… and fourth were puck lights from the Canadian tire. I removed the electronics from them and used only the covers to allow the light to pass through. Though they weren’t the same shape as the eyes in my concept, the puck lights seemed like the best fit. A structure was formed around these and then attached to the helmet to create the lips and rest of the head. Head and jaw structure beginning to be attached. So I did what I usually do! I waste a full 3 days angrily staring at the piece. Occasionally I would hold a stick up to an area and then, inevitably, putting it back down. note: I have mastered fantastic avoidance techniques. If I could harness this pure will of stubbornness into actual productive behaviour… Well, I think I could be unstoppable! Finally I decide it’s time to remove my reference from the drawer and take a good look at whats happening. fixed and beginning to paper! I pulled the cheeks inwards, but lost the puffy red cheeks in the process. the philtrum (the skin between your nose and top lip) was shortened, and the lips brought into a straight curve to form a smile. 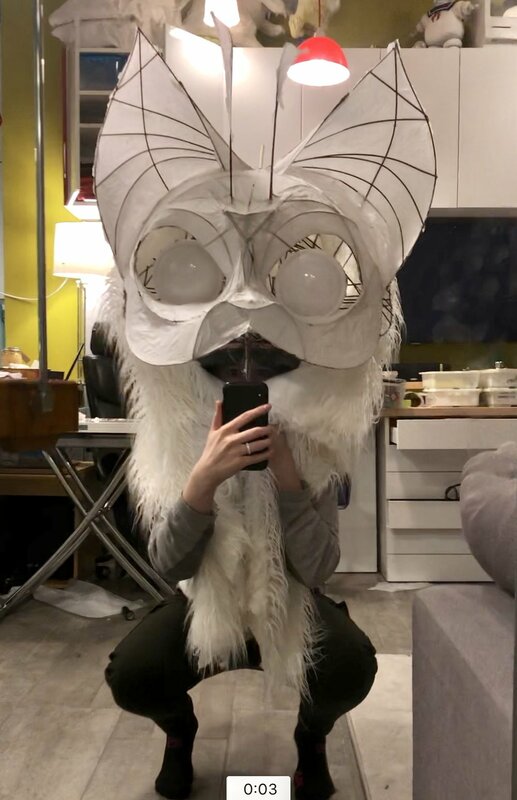 Now that I had the shape I wanted, I needed to work on the fur. One evening, while goofing around, my partner wrapped some fur fabric (that I had long forgotten I had) around my head. I’m temporarily holding the fabric here so that I know how it will fall around the bottom jaw. speaking of the bottom jaw! Originally, the jaw would be a separate structure, allow the mouth to open and close. However, once the top portion of the head was finished, I was extremely pleased with the motion and personality it had already! This is genuinely not a decision made from laziness, but purely a mid-project design change. Note: These changes are something I would not have been able to embrace in the past. or at least, not without ruining the project ten times, getting upset and then waiting a year to try again! 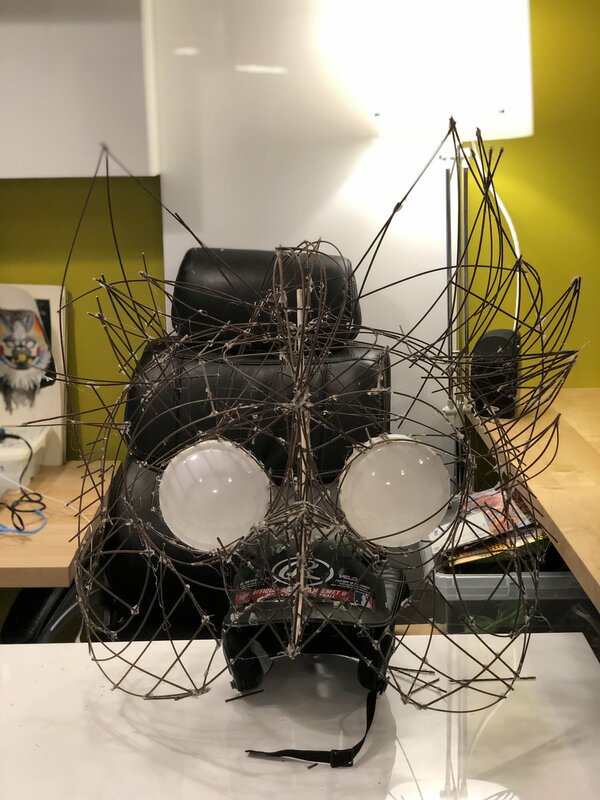 with the choice to connect the bottom jaw straight to the head made, it was extremely easy and fast to finish up the rest of the project! It does have its differences from the original concept art ie. 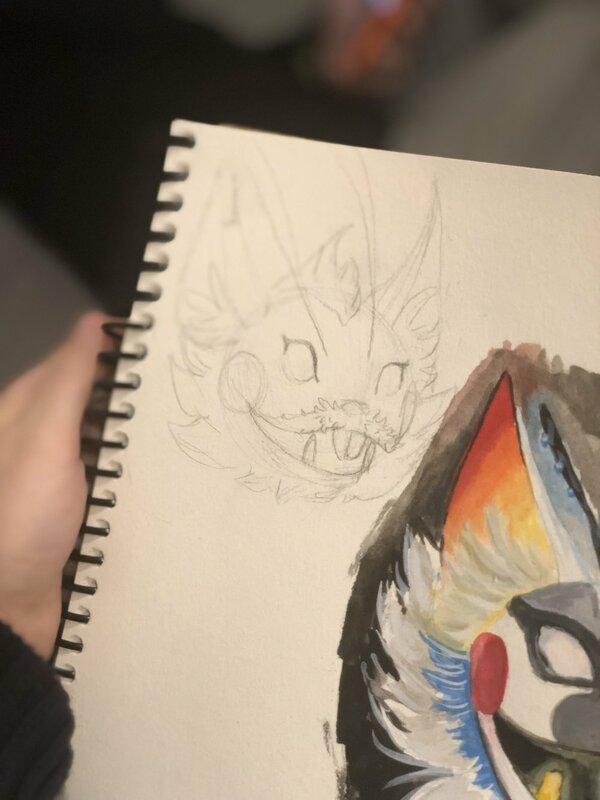 I chose to connect the jaw, the eyes have been rounded, and most notably- the lack of colour. In the end I wasn’t confident in making the colours look vibrant and… well, not tacky. I chose to stick with white because it is the traditional colour anyway. Here is the view from my perspective. I had very little peripheral vision and could not see me feet at all. and some shots of the the finished piece during and after the parade! 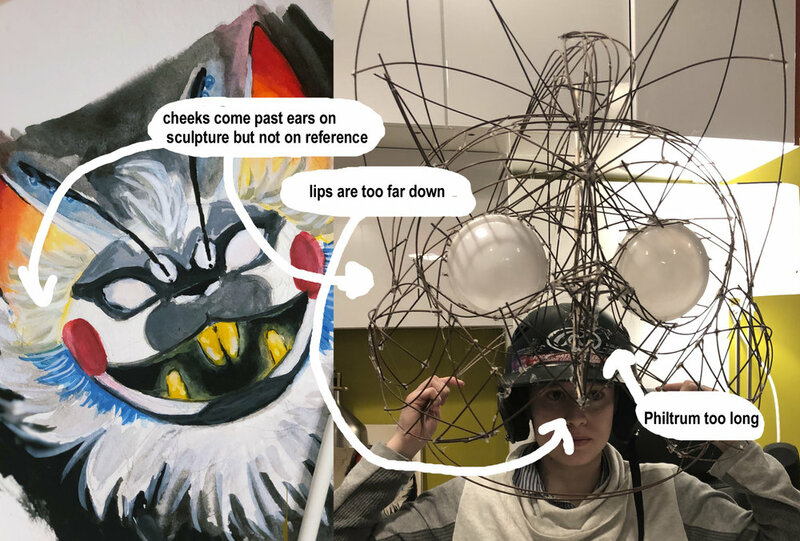 Note: I was very worried my sculpture would scare children (like to the point of trauma!) but it turns out the children love it! I was stopped so many times by someone gently tugging on my coat to get my attention. I would kneel down to their level and they all looked so happy! I was very relieved. I would like to thank you to Quarters Arts for giving me this opportunity every year! As much as I enjoy the process of creating my own lantern, I also love being able to help others develop their ideas and bring them to life. See you all again next year for glows fifth annual spring equinox parade! 8 months ago I was given the opportunity to paint a guitar for a family friend, Rhonda. This blog details all the troubles I experienced while performing this completely unknown task. When I agreed to this project I did not have to worry about ruining the sound or injuring the instrument because it had been previously damaged and was no longer playable. However, because I had never attempted a project like this and I wasn't sure how it would turn out, we agreed that I would only charge her for the material costs. As with nearly every projects I set out to do, I was completely unprepared for the problems to come. The issues began with my house. I needed to sand down the front of the guitar before painting, but my house is small. like bachelor pad small. With carpets and birds that have sensitive lungs. It's also in a high rise, smack dab in the middle of the city. So no yard, no garage; and I wasn't about to go sit in the stinky ally with the homeless people (as nice as they may seem.) Since my bathroom is mainly tile and the only room that actually has a door, I sat myself on the hard toilet and positioned the guitar between The wall and my legs... comfy. This is me. 10 hours into sanding and nearly done! Let me start of by saying I'm cheap, and I was determined to keep material costs for this project at a minimum. However, sanding this thing by hand was literally taking forever. On hour five, and less then quarter of the way done, I found myself standing in a hardware store with a power sander in hand. The guitar looked so pretty sanded I nearly didn't want to paint it! However, after some thought in regards to Rhonda's tastes, I chose to paint the silhouette of a fox. Inside the silhouette would be a mountain scene that would wind down the body and become a tangle of vines for the tail. This is the project mid-way. I became furious with that horrible, yucky, mess of a tail (or as my boyfriend, Dean, kept calling it "a field of wheat!") and ended up abandoning the entire project for about 3 months. This may seems like an excessive amount of time to you, and you may think I actually forgot about it, but NO! That thing sat on the edge of my living room, nagging at me every time I sat on the couch for approximately 80 days (not that I was counting.) I stewed and scowled at it and some days even went so far as to stick my tongue at it. I would find myself pacing, scratching my head I tried squinting my eyes, leaning close, standing far away and tilting my head to the side. This would continue until my brain ached. Finally, in a fit of anger, I picked it up, I grabbed a wet brush and I rubbed that tail until it was one large blotch of yucky, poo brown, paint. I think after that I kind of went into shock because it was another month before I could bring myself to touch it again. I am relieved to say however, I overcame my frustrations and painted in some rather beautiful white leaves with a bright red background. Did anyone else know you can't blend Red and Green? because it turns out I know nothing about colour theory. I fought and fought with the green body and the red tail for weeks. trying without success to make them meld. it wasn't until one fateful evening when I was into my umpteenth fit of tears that Dean came to my side and asked one simple question. "what are trying to achieve?" Through hiccups and tears I explained that my red and green refused to work together and because of that the whole thing looked terrible and I would never be able to finish and, and, AND LIFE IS HORRIBLE. You wouldn't believe he laughed at me. LAUGHED. But you know what, It's okay. I laugh at me too now. You see it turns out you can't blend green and red. They are on opposite sides of the colour wheel. It simply cannot be done. The trick was purple! Honestly it makes sense that I didn't think of this, because, to put it nicely, I hate purple. With a passion. I had to add the purple to combine my red to my blue (I had added the blue thinking I could use blue to mix green and red...) and then I added orange and yellow to finally connect my green to my red! I went to the art store glowing with confidence, a smile on my face, and a skip in my step. I was nearly done. I just needed to get a waterproof sealant and it would all be over. I went to the front desk to declare I needed to order some (because of course they were out of the only kind I needed...) The lady was very nice and was interested in what I was up to. I declared with boundless pride that I was doing a water colour painting on a guitar and I needed the golden archives to seal it. I saw the panic in her eyes, and at that moment, I swear, I thought the world was going to end. We ended up having a very long discussion regarding how incredibly stupid I am for using water colour on a guitar, and that I was even dumber for thinking I could use something like a spray fixative on WATER colour (which you know, RUNS when it gets WET...) There were other problems too. Like it not sticking to the wax in the wax based water colours I used, which could result in bubbling and peeling. Possibly destroying everything I had worked so hard on. I went home in utter depression, sat down on my couch and for the thousands time, looked over to see the guitar nagging at me from the corner of the room. After some studying though, I decided the archival spray was really my best option. It had to be sealed and putting it in a glass frame to protect it from the elements wasn't an option. Besides, if I was going to ruin it, I might as well use the high class spray to do it. of course I tested it first. Unexpectedly, It didn't seem to damage my testing stick, so feeling as confident as I was going to I brought the guitar out to the stinking ally. and began to spray. I believe I sprayed the guitar about 10 times. Waiting 30mins between coats. This is pretty much the end of the project, but not my frustrations. I thought I had done very well keeping my costs at a minimum. However, after adding all the material costs together I managed to hit a startling $102.32. To say the very least, I was in shock. I can only imagine Rhonda's jaw hit the ground when I sent her the bill. What I'm sure both of us thought was going to be a $20 dollar project had suddenly quadrupled in price. I would like to emphasize how incredibly eye opening This project has been for me. It has not only given me a whole new level of appreciation for other artists work but shown me how much I still need to learn and how much I have learned while working through all of this. I am taking my first steps into understanding material costs and how to price my later pieces. I am learning new skills every time I start one of these insane pieces, and honestly, though I know more tears and frustration will be waiting for me, I cannot wait to start my next one! I would like to say thank you to Dean for being by my side and helping me through all the tears. Thank you for laughing at me when I needed it and putting up with that guitar in the middle of house for 8 months. Thank you for all the encouragement even when I knew you wanted to strangle me. You are truly wonderful to me. Lastly, thank you Rhonda. Thank you for not blowing your top when I sent you that enormous bill. Thank you for believing in my skills and thank you for giving me this amazing opportunity to learn on your precious instrument. Every piece I do gets me that much closer to achieving my goal as a successful artist. I truly hope you love your guitar even more now. I know it is in a good home and will be treated well. It's been over a year since I've made a fondant cake. My itch to create something with cake was becoming an incessant nag when my mother called saying we would be having a birthday party for both my older brother and nephew. Since I had missed my younger brothers birthday I figured I would add his name on there too. I mean, how hard could that be? So begins the challenge of making three personalized cakes in one. I decided on a three tier cake. This is something I had never attempted. I knew there would be complications, I just wasn't sure what they would be yet... So with little understanding of what was in store for me I began my 4 day cake making extravagansa. Day 2- Making fondant. For anyone interested in fondant that actually TASTES GOOD, then I have a recipe for you. It's called marshmallow fondant, and it will be your next best friend in cake making. Take the marshmallow, stick in a bowl, throw it in the microwave (about 30 seconds,) pour some icing sugar in and start stirring. Yes it will stick at first, but don't panic. Keep adding icing sugar until it is cool and pliable enough to kneed with your hands. Once the mixture has stopped sticking to your fingers you can us it right away like regular fondant, or put it in a bowl with a bit of icing sugar on the bottom, (to prevent sticking) some cellophane wrap, (to prevent it from drying out) and stick it in the fridge until you need it. Tip: if you are going to make several batches, be sure to wash out your bowl. The icing sugar and drying marshmallow from the previous batch can leave little lumps in the new one. Tip for my previous tip: use very hot water to wash the bowl. It's WAY easier then trying to scrub it. The wonderful thing about this stuff is that it works just as well as regular fondant, but tastes a million times better! I used an edible silver dye for the metal and tiny silver candy balls for the screws. Once the individual layers had finished the trouble began. Individually the cakes looked quite good. together however, I realized my nephews layer had thrown off the colour scheme I was trying to create. On top of this I realized my cakes weren't quite straight, making the layers tilt slightly. The cake was put in the fridge and so began my evening of stomping about, my eye brows furrowed in frustration and my face in a permanent pouty look. I began to contemplate why I do this to myself. I swear the stress is taking years off my life. Note: I would like to thank the love of my life for all his patience. Honestly I don't know how he can put up with my emotions sometimes. In an attempt to fix my mistake I added silver food colouring between the skittles and silver balls to add continuity. It helped. A little... Time to present it to the birthday boys. As you can see the colour scheme wasn't my only issue. As the cakes warmed up on the car ride the heavy layers began to sink into one another. having never done a cake with more then two tiers I had not thought of of this complication occurring. Though There where many mistakes in my eyes my family still loved loved it. It was a huge success and I am already getting requests for my next cake. Note: turns out there is a lot of dye in my black fondant as it turned my mothers tongue black. heres some news about what I'm up to!